This website is the companion of "Non-equilibrium ionisation and cooling of metal-enriched gas in the presence of a photo-ionisation background" authored by Benjamin D. Oppenheimer and Joop Schaye, and submitted to MNRAS for publication. Below are some supplementary materials to this publication for use by the community. Please e-mail oppenheimer at strw dot leidenuniv dot nl for any additional questions. 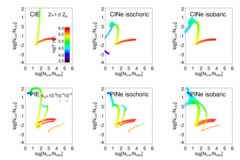 Simulations of the formation of galaxies, as well as ionisation models used to interpret observations of quasar absorption lines, generally either assume ionisation equilibrium or ignore the presence of the extra-galactic background (EGB) radiation. We introduce a method to compute the non-equilibrium ionisation and cooling of diffuse gas exposed to the EGB. Our method iterates the ionisation states of the 11 elements that dominate the cooling (H, He, C, N, O, Ne, Si, Mg, S, Ca, & Fe) and uses tabulated ion-by-ion cooling and photo-heating efficiencies to update the temperature of the gas. Our reaction network includes radiative and di-electric recombination, collisional ionisation, photo-ionisation, Auger ionisation, and charge transfer. We verify that our method reproduces published results for collisional equilibrium, collisional non-equilibrium, and photo-ionised equilibrium. Non-equilibrium effects can become very important in cooling gas, particularly below 106 K. Photo-ionisation and non-equilibrium effects both tend to boost the degree of ionisation and to reduce cooling efficiencies. The effect of the EGB is larger for lower densities (i.e. higher ionisation parameters). Hence, photo-ionisation affects (equilibrium and non-equilibrium) cooling more under isochoric than under isobaric conditions. Non-equilibrium effects are smaller in the presence of the EGB and are thus overestimated when using collisional-only processes. The inclusion of the EGB alters the observational diagnostics of diffuse, metal-enriched gas (e.g. metal absorption lines probed in quasar sight lines) even more significantly than the cooling efficiencies. We argue that the cooling efficiency should be considered if ionisation models are used to infer physical conditions from observed line ratios, as the a priori probability of observing gas is lower if its cooling time is shorter. We provide on-line tables of ionisation fractions and cooling efficiencies, as well as other data, for equilibrium and non-equilibrium scenarios, and both with and without an EGB. Cooling efficiencies and diagnostics of the physical state of diffuse gas can become highly inaccurate if ionisation equilibrium is assumed or if the existence of the ionising background is ignored. Provided below are non-equilibrium (and equilibrium) calculations of ion fractions as a function of temperature in the presence of a photo-ionising extra-galactic background (EGB) field. Non-equilibrium effects are known to reduce cooling rates and alter ion fractions owing to significant recombination times compared to cooling times. 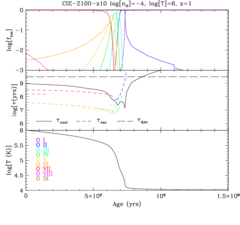 Gnat & Sternberg (2007) published ion fractions as a function of temperature including collisional-only processes for several metallicities. The presence of an EGB breaks the density-independence of collisional processes, therefore we have to consider the additional effects of photo-ionisation and photo-heating. 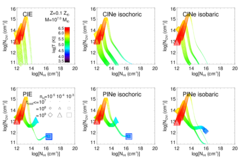 These two effects have a density-dependence and also depend on the shape of the EGB, which evolves with redshift. Hence, we provide ion fractions at 7 densities corresponding to diffuse gas at 8 redshifts for two backgrounds (Haardt & Madau 2001 & 2012). Each link in the redshift-metallicity grid below will take you to a page with ascii tables for 7 densities and 8 commonly observed elements in the IGM for photo-ionised non-equilibrium cooling gases (both isochoric and isobaric) as well as photo-ionised equilibrium isochoric cooling. Along with ion fractions are cooling times and rates, which are useful to determine the likelihood of an ionisation fraction in a radiatively cooling gas. Also included are collisional-only tables for comparison with the photo-ionised tables. 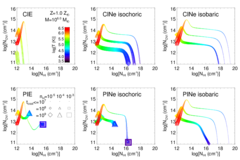 Included below are hdf5 tables holding atomic data for inclusion into hydrodynamic simulations, which include an ionisation solver and cooling module (see paper for a description of our method). 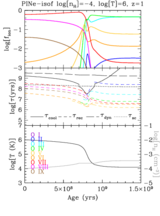 Included are recombination and collisional ionisation data as functions of temperature and photo-ionisation cross-sections as a function of redshift for the given field. Also included are charge transfer and Auger ionisation. 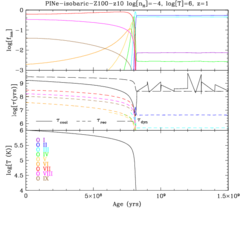 Ion-by-ion cooling rates as a function of temperature and photo-heating rates as a function of redshift are also included. A table exists for each element. Please e-mail Ben for more specific details. UPDATE June 2, 2014- The HM01 and HM12 tables have been updated with comments and units listed and reformatted for ease of use. 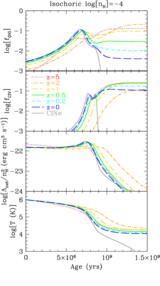 These are updated cooling tables as a function of density, temperature, redshift, and helium fraction by atomic species. Go here to see the original publication, which calculated cooling given the Haardt & Madau (2001) EGB using CLOUDY ver. 07.02. We have recalculated these tables for both the Haardt & Madau (2001) and (2012) backgrounds using CLOUDY ver. 10.00. 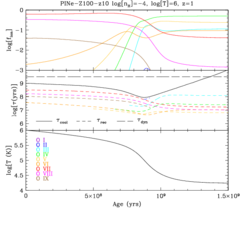 Two movies show the progress of non-equilibrium ionisation for a grid of temperatures and densities corresponding to diffuse gas. Six elements are displayed: H, He, C, O, Ne, & Fe. A static z=1.0 extra-galactic background (EGB) is assumed at all times. 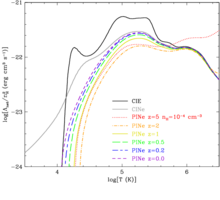 Colours represent the averaged ionisation state (dark blue is neutral, dark red is completely ionised). One movie begins with all gas in the neutral state at t=0 and the other begins with all elements completely ionised. These movies are meant to complement Figure 1 in the paper. No cooling is applied in these cases as temperatures are held constant. 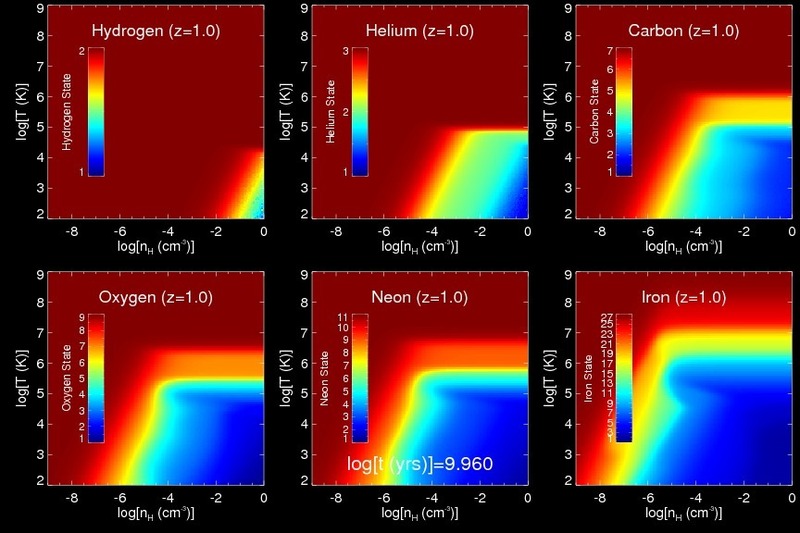 The figures below supplement the figures in the paper, providing further figures that did not fit in the paper as well as examples of ionisation modelling. Clicking on each thumbnail below will show the expanded figure with a caption. 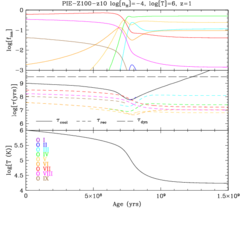 Collisional ionisation equilibrium (CIE) time evolution of a cooling gas. 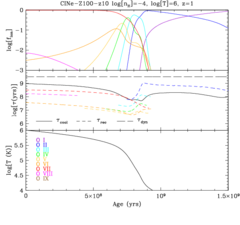 Collisional ionisation non-equilibrium (CINe isochoric) time evolution of a cooling gas. Photo-ionisation equilibrium (PIE) time evolution of a cooling gas. Photo-ionisation non-equilibrium (PINe isochoric) time evolution of a cooling gas. Photo-ionisation non-equilibrium (PINe isobaric) time evolution of a cooling gas. Evolution of a 108 solar mass cloud under PINe conditions. CIV/OVI ratio as a function of CIV/SiIV ratio. CIV/OVI ratio as a function of OVI column density at solar metallicity. CIV/OVI ratio as a function of OVI column density at 0.1 solar metallicity. OVI column density as a function of HI column density at solar metallicity. 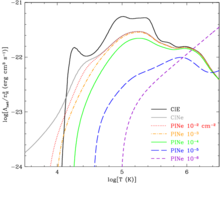 OVI column density as a function of HI column density at 0.1 solar metallicity. Comparison of our method's ion fractions to those of CLOUDY ver. 10.00 for 47 ion species in density-temperature "phase"-space. These figures complement Figure A.1 in the paper. Agreement is generally very good, except for photo-ionised temperatures for sulphur, calcium, and iron species, which often use a different set of dielectronic recombination coefficients in CLOUDY compared to us. The atomic data for these ions is less well-known. The CUBA code website used to access Haardt & Madau extra-galactic backgrounds.